Okay, just come off the phone with Steve (Nice chap that did the Caledonian Canal with us) and we are planning to sail the wash over the next two weeks. We plan to sail from the Skegness side down to Hunstanton/ Cromer, overnite in the tents/ Steve's camper van and sail back the next day. We can't be precise about dates because the weather will play a big part and we don't want to go out if the winds are above 8 to 10 mph. This trip will be open to competent canoe sailors who have reliable well tested canoes. Drysuits will be required and VHF radio's an advantage. We welcome others joining us, but we cannot take anyone without the proper equipment or with a canoe that appears to be incapable for such a crossing as we can't afford for things to go wrong 6-miles from the nearest shore. (The crossing is 12-miles wide) Please get in touch if you are unsure about your equipment/ canoe or sailing ability. 'Tidal Havens of the Wash & Humber' by Henry Irving, an Imray publication, gives some very good (and essential ) information of the tidal streams in the Wash, more appropriate to us than the info on the usual charts. 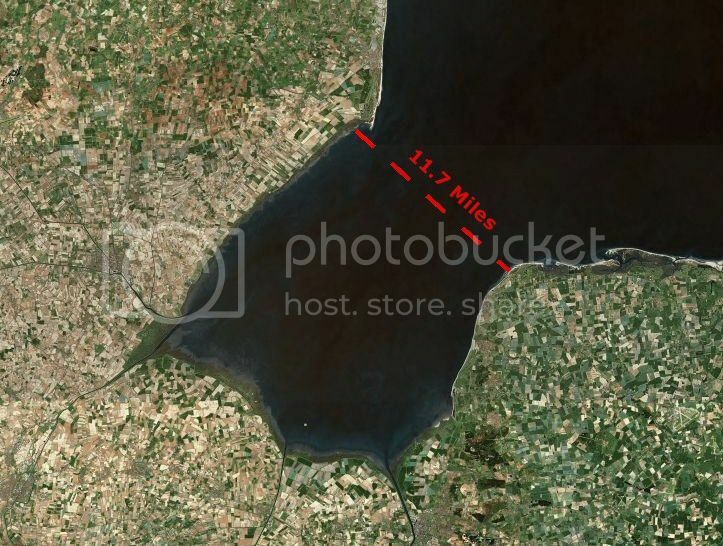 Our starting point would be on the Hunstanton side, but due to the tidal effect (and that we would be paddling) we would have to start down near Snettisham so we didn't end up in the North Sea before making Skegness. If the wind dies then you could end up paddling, and I reckoned we would have ended up paddling nearer 18 miles under paddle power due to the effects of tide. Just on a personal note, I'd insist on every member having a vhf radio in case you get separated out in the middle. All the above you have no doubt covered, I only mention so as to be on the safe side and to be of help. Thanks Davy. Next weekend there is a North Easterly wind forecast which would help to keep us away from the North Sea and then it's a case of timing your departure with the tides so that you are not being dragged out to sea. I was thinking about taking my electric outboard motor as a backup plan. This gives me about 45-minutes at full power or an hour and a half at half power, but lugging it around with the leisure battery is no fun. At full power, it will push me along quite well. See below. I could just stick it in a drybag and lash it up the front of the canoe. If the very worsed did happen, it's a plan B.
Steve and I both have VHF radios and used them quite a bit in Scotland this year. I have sailed in The Wash before but stayed within a mile from the shore line and your right, the tidal currents can be strong, especially around Kings Lynn. I haven't read the book, so I'll look up a copy, and thanks for the advice. I am hoping that at least one other person comes as three is the minimum number ideally for any expedition. Two other people have contacted me already and expressed an interest. It should only take between 4 & 6-hours depending on the weather & tides. An excellent adventure chaps. I wish you all the best and look forward to a great blog. Gentle breeze 12–19 km/h (3–5 m/s) 0.5–1 m Large wavelets. Crests begin to break; scattered whitecaps Leaves and small twigs constantly moving, light flags extended. That's great... but a gentle breeze from the NE would mean a "fetch" all the way to Scandinavia... and could mean some big swells... and if the tide was ebbing at 4 knots... I suspect conditions could get "interesting", especially over the shallows either side of the "Boston Deep". Even if the breeze came from the SW, the fetch would be well over 10 nm: enough to allow a significant swell to develop. I trust you'd avoid a flood tide over the shallows with a SW wind. A predicted 10-12 mph "gentle breeze" could easily die into nothing... or could amount to nothing if the tide was sweeping you in the same direction (reducing the apparent wind). The ability to paddle the entire crossing in calm conditions would strike me as an essential pre-requisite. Fresh breeze 29–38 km/h (8.1-10.6 m/s) 2–3 m Moderate waves of some length. Many whitecaps. Small amounts of spray. Branches of a moderate size move. Small trees in leaf begin to sway. A F5 would require reefing (so sails should have that option)... and would entail a very real possibility of swamping. In an open canoe, I'd be carrying a LOT of airbags: enough to make progress if swamped. I'd ideally have a self bailer. Beyond all of that, there's always the issue of rig failure. Paddling is one's back-up mode in the event of rig failure. For this scale of undertaking... those taking part really ought to be capable of coping by paddle in a squally F5 if setting off in a predicted F3. Rig failure shouldn't be grounds for a distress call on the VHF! The crossing strikes me as eminently viable... but as easily underestimated! My electric outboard (a Min Kota ) - and most others I've seen are not for use on salt water. You'd need to check the manufacturer's specs. Good luck with your venture, Chris. I assume you will not be using outriggers of any sort? Let's hope you don't feel the need for them on the crossing... Having talked with Gavin about his experiences recently it is certainly a serious undertaking. My couple of days sailing with him on the Yorkshire coast was very educational for me about the nature and size of waves that can be encountered on the east coast - I've yet to put a video account together of those experiences but believe me it was rather exciting. Hi guys thanks for your thoughts. Steve was suggesting a night camping at one end or another, but I would rather leave the camping gear and sail as light as possible so if I do capsize, it's no big drama. I have sailed in the Med off the coast of Gibraltar and the currents there must be second to none, but you don't have sand/ mud banks to contend with. I won't attempt this crossing if I don't feel comfortable with the conditions and that includes driving to coast going on the water and coming straight back off it if I am not comfortable. There will always be another day to have another go. I only live 40-minutes drive away. Sue, the Watersnake motor I have with 34 lbs of thrust can handle salt water, but corrosion can become a problem and is not recommended if you want a long life from it, but using it in the case of an emergency, corrosion would not be a major concern. That said, I am tempted to leave it behind, go light and prepare to do a lot of paddling if necessary. Update. 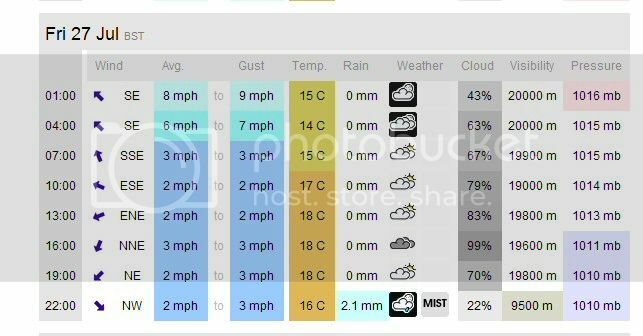 Having planned time off work to make this trip on Friday with Steve, which coinsides with neap tides, the XCweather forecast has just revised the conditions from 10-mph winds down to 2-mph winds!!! The currents in the wash will be many times stronger than the winds and it would be unwise to attempt a 12-mile crossing in light winds and strong tidal currents. We will probably still meet up at Hunstanton and have a paddle in any case. It will allow us to talk to members of the Hunstanton Sailing Club and get some more tips about making the trip another day. Of course the weather forecast could change again before Friday. Friday [...] coinsides with neap tides, the XCweather forecast has just revised the conditions from 10-mph winds down to 2-mph winds!!! [...] it would be unwise to attempt a 12-mile crossing in light winds and strong tidal currents. OK - Friday is 27th.. and POL says High Water Immingham is 11:22 gmt... so 12:22 bst... and with a 6.42m tide, that's just a day away from neaps. So far, so good! Checking Windguru... the swell looks as good as it's likely to get: 0.3m-0.4m (though probably amplified over the sandbanks). Now the wind direction (on XC and Windguru) looks like starting SE and then backing around to the NE: starting across the tide... but then against the ebb in the afternoon - which will affect the sea state, but will also increase the apparent wind. Beyond all of that, the pressure looks like being high, and the conditions pretty fine: some local knowledge would be good, but I'd suggest there's a good chance of a sea breeze kicking in during the afternoon - if so, some idea of scale and likely direction would be good! The forecast might change a lot between now and Friday, but to me, these currently look like near-perfect conditions for a crossing of the Wash: the crossing would remain a serious undertaking... but I can't see that a forecast for more wind would be an improvement! I'd be aiming to leave well before HW, accepting that I'd get swept a little to the SW (towards Roaring Middle).... but aiming to be at Long Sand not too long after slack water (when there would be not much current, and plenty of depth) with a view to riding the ebb up the Boston Deep. The fun bit could be getting into Wainfleet Haven against the ebb tide: might be a case of bobbing around for a bit and waiting for the flood.. or getting a little muddy! Greg, this was pretty much our exact plan except 10mph winds would give us the power we need to make progress. Bobbing around becalmed in the middle of The Wash 6-miles from anywhere is far from ideal and the idea of paddling the whole trip is not my idea of a good time. We are still getting ready for some kind of sailing/ paddling this Friday, but unless we have some wind, I can't see it happening. Alternatively too much wind will not allow the trip to happen either. I have wanted to do The Wash for a few years now, but I won't take unnecessary risks. Steve and I have agreed to travel to the area, possibly get the canoes onto the water if conditions are borderline and see how we feel. If we both feel confident, we will set off, but if one of us isn't comfortable, we will probably just sail along the coast, pitch up among the dunes, get a few tents up and eat some hot food with a bottle of wine or a few beers!